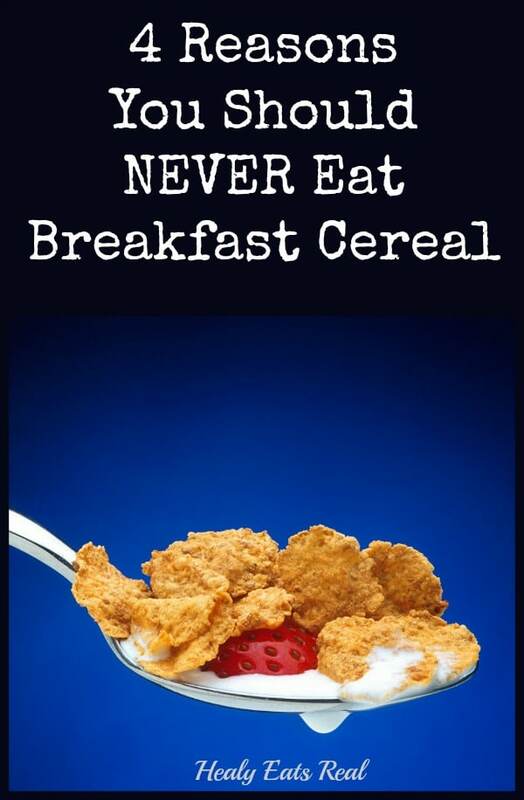 Many people think that eating breakfast cereal is healthy. It says so on the commercials, right? It’s part of this complete breakfast! Well, that’s not exactly true…it’s more clever marketing than anything. 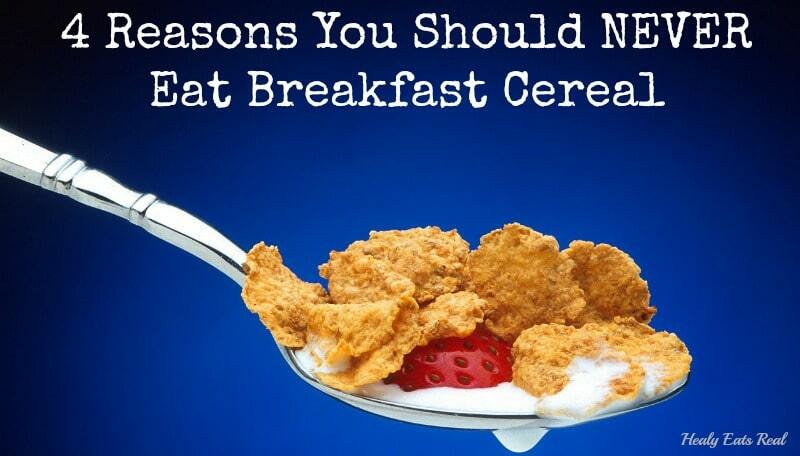 Check out all the reasons below that I don’t eat cereal for breakfast! It’s loaded with sugar, which is the last thing you want to have for breakfast. It spikes blood sugar and sets you on a day of blood sugar peaks and crashes leading to sugar cravings, increased hunger, metabolic issues, etc. In fact, raisin bran, which is supposed to be the boring healthy cereal actually has 20 grams of sugar per serving!! Add some 2% milk to that and you’ve got yourself a total of 32 grams of sugar for breakfast. Want to know how much sugar is in a snickers bar??? 27 grams. So now you’re eating more sugar than a snickers bar for breakfast…not good. Learn more about avoiding sugar here and here. It contains over-processed wheat, which mainstream recommendations love to say is healthy, but it is actually processed by your body like sugar is–even if it is “whole grain”. Wheat has the ability to spike blood sugar just like processed sugar does. The glycemic index (GI) of foods is a good way to tell how it affects your blood sugar. To give you an idea, a snicker’s bar has a GI of 68, which is high, meaning that it spikes blood sugar. The GI of whole wheat is about 72! Eating a diet rich in high GI foods can contribute to chronic disease like diabetes (1). Wheat is also hard to digest, and along with other processed carbohydrates, it’s associated with increased inflammation, gastrointestinal issues, obesity, leaky gut and chronic disease (2, 3, 4). This book is a great resource for learning more about wheat and why it’s not so healthy. It contains GMOs, which have been shown to cause health issues in lab rats…but monsanto doesn’t want you to know that. Learn more about GMOs here. Things like eggs, bacon, avocado, sausage and veggies and high-protein smoothies are good ideas from breakfast.